You know Paul Mitchell and you know Patr�n. Now meet John Paul DeJoria. FORTUNE -- There are a lot of interesting things about John Paul DeJoria. Yes, he's the co-founder of John Paul Mitchell Systems, which sells hair products in more than 150,000 beauty salons in 87 countries. Many of us are familiar with his shampoo if not DeJoria himself. But few know about his other ventures. The 68-year-old DeJoria was also founder of more than a dozen other businesses, from Patrón Spirits to the House of Blues to DeJoria Diamonds. And then there's his hardscrabble life. He worked to help support his family when he was a kid, and he was even homeless twice once just as he launched John Paul Mitchell. I grew up in Echo Park, Calif., which was European, Asian, and Hispanic. We didn't know we didn't have anything because we had nothing else to judge things by. My parents divorced when I was 2, and my first job was selling Christmas cards door-to-door when I was 9. When I was 11, I was delivering the Los Angeles Examiner before school. I graduated high school at 17 and went into the Navy. When I got out of the service in 1964, I didn't have the money to go to college, so I worked as a salesman for Collier's Encyclopedia. I had 10 jobs for the next several years until John Capra, a friend who was an employment counselor, said I should try the beauty industry. He said it didn't pay much at first, but there was no end to where you could go with it. So in 1971 I became a Redken representative, selling hair care products. I started with a $600-a-month salary and a $125-a-month car allowance. After a year and a half I was running two divisions -- scientific schools and chain salons -- with two secretaries and four people. Doing so much with so few people made the regional managers look bad. Plus, I didn't play the socializing game with them. They said I wasn't their type of manager, and fired me in 1975. Next, I went to work for Fermodyl Hair Care, which hired me to train their management and sales force on how to sell. Sales went up 50% over the year I was there, but they said I didn't fit in. I never missed business events, but I didn't hang out with them socially. I started selling for another hair care company, the Institute of Trichology, where I got $3,000 a month plus 6% of all new business that I brought in. After a year there they fired me because they said I made more money than the owner. When people fire you for not being their kind of manager, it makes you want to be your own manager. I think being fired was meant to be, though, because I learned something about sales, manufacturing, and marketing from each of those companies, which helped me start John Paul Mitchell Systems. In 1980 my friend Paul [Mitchell] was struggling, so I said, "Why don't we start a business together?" We were both in the hair care business, and decided to create products for professional stylists that would cut the time needed to do a client's hair. The first products we created were a single-application shampoo, where other shampoos at the time were multi-application, and a leave-in conditioner that improved blow-dry results. Paul would own 30% of the company, I'd own 30%, and a European investor contributing $500,000 would then own 40%. But the investor changed his mind, and the money wasn't there. Paul was on his last leg. Things weren't going well with my former wife, so I gave her all the money and moved out. I was too proud to tell my friends that I only had a few hundred dollars. So I lived in my car in Los Angeles for a while, and we started the company with $700. To start, I got a sample run made of two shampoos and a conditioner. We had two weeks before the first bill was due. So I went knocking on salon doors and got 12 orders and checks, then went to Paris Ace Beauty Supplies, our first distributor. They agreed to take our line on, and we paid our first bill. I had parked my car on Mulholland Drive because it was safe there. One day the actress Joanna Pettet [who appeared in the TV series Dr. Kildare and Knots Landing] knocked on my car. We knew each other from years past, and she said I could have a room in her house free for two months, but I'd have to pay rent after that. So I got a post office box for $15 and got some cards printed up saying JOHN PAUL MITCHELL SYSTEMS with her phone number on it. When you called, you'd hear her English accent on the answering machine saying, "J.P. will call you back." For the first two years it was hand to mouth. After two years Paul and I had made close to $1 million gross and had enough to give ourselves each a $2,000 dividend. We had no loans. Everything was in inventory. It wasn't nationwide yet, but we were in a number of salons. It got rolling and rolling until it got into the hundreds of millions. I've always supported environmental causes, and in 1986 a businessman named Michael Gustin asked if I'd want to fund a company that does advanced exploration of gas and oil with ecology in mind. I said yes, so we started Gustin Energy Cos. In 1989 my partner [Paul Mitchell] died, and I started the Patrón Spirits Co. with my friend Martin Crowley, an architect who'd gone to Mexico to do some work. I said bring me back some tequila. He found a hand-blown bottle and said, "I could design a label for this. Want to make a smoother tequila and go into business?" So I decided to make the first 12,000 bottles. Blue agave is so expensive, but even at $37 a bottle, I believed the world was ready for a high-end product. My friend Clint Eastwood put Patrón in his movie In the Line of Fire, and Wolfgang Puck turned all his friends on to it. At Paul Mitchell, we gave it free to people at events. Today we're the world's ultra-premium tequila, and in 2011 we sold approximately 2,450,000 cases. I own about 70% of Patrón. Starting so many businesses was just what happened. The key is to be excited and passionate about what you are starting, and the quality with which you produce something. It's amazing what a human is capable of doing if they really like something. I'm not a great detail man. Thank God for accountants and assistants. 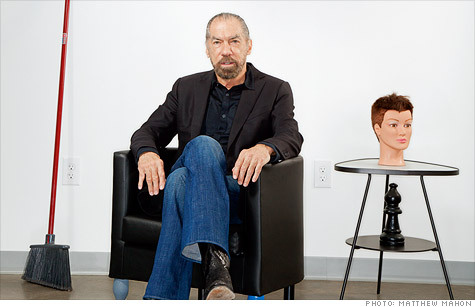 The majority of my time is spent with John Paul Mitchell Systems as CEO and chairman. The company is privately held, and we continue to grow every year. For the rest of my companies, I have great presidents who handle things. All my businesses were started out of personal interests. 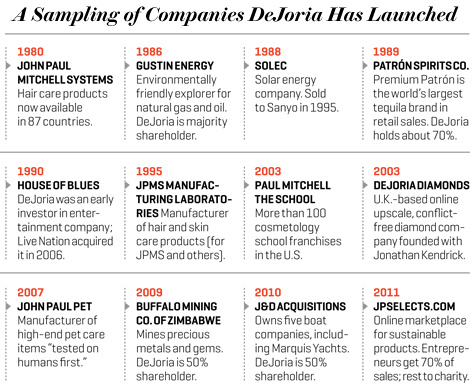 DeJoria Diamonds, for example, sells conflict-free diamonds. It was a way to make a statement and help change the world. Success unshared is failure. Be prepared for rejection. If you're prepared, you won't stop after the first few doors get slammed in your face. In my early twenties, I sold encyclopedias door to door. When you have 10 to 15 doors slammed in your face, you still need to be as enthusiastic at door No. 16 as you were at door No. 1. The average career of an encyclopedia salesman was three days. I worked for Collier's for 3_ years. Make the highest-quality products. A lot of people make things to sell. But when the product is old, the consumer tosses it out and buys something else. If you make things with the highest quality, you'll be in the reorder business, which keeps the sales growing. Practice sustainability. We looked at costs in our warehouse system -- everything from what doors can we shut to what lights can we change. We found ways to create a 25% savings in our power costs. We plant trees to offset our Tea Tree shampoo line, to make up for the carbon we use. It's good for the world and good for business.